Last March, the United States Postal Service made history when it issued the first U.S. postage stamp commemorating a Broadway musical. 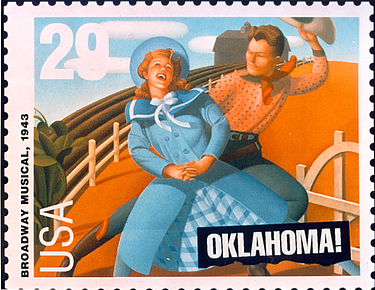 The honoree was OKLAHOMA!, and the stamp was released in special ceremonies in New York and Oklahoma to coincide with the musical's 50th Anniversary. The 29 cent stamp has continued to do very well throughout the country, and in Oklahoma itself, we are told, it has even outsold Elvis. In July the OKLAHOMA! stamp was reissued as part of a four-stamp set honoring the Broadway musical, this time joined by SHOW BOAT, PORGY AND BESS and MY FAIR LADY. Postmaster General Marvin Runyon presided over the first day ceremonies held as part of "Broadway on Broadway," a spectacular outdoor concert in Times Square on Wednesday afternoon, July 14. 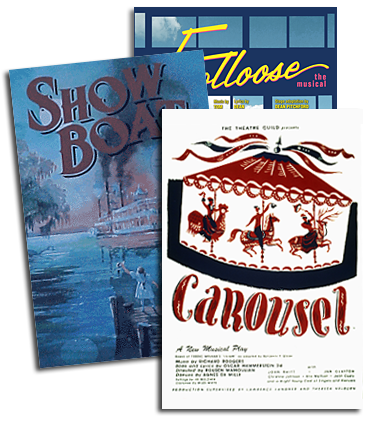 Over 45,000 people attended the event, which featured a special musical segment in honor of these four classics. Among the highlights were Paul Gemignani leading his orchestra in the rousing OKLAHOMA! overture, Bruce Adler (of the '79 revival of OKLAHOMA! and currently CRAZY FOR YOU) and Maureen Moore with "All Er Nothin'" and Michel Warren Bell of the upcoming Toronto SHOW BOAT (see cover story), who stopped the show - and stopped traffic - with his stirring rendition of "Ol' Man River."